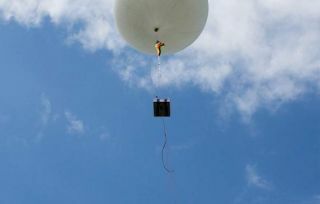 A quantum experiment built by Singapore's Centre for Quantum Technologies had a test launch aboard a weather balloon on May 18, 2012. A quantum communication experiment tucked inside a tiny satellite could someday lead to a global network for sending or receiving unbreakable codes. One of the first steps came during a weather balloon flight to test whether a quantum experiment's hardware could survive near-space conditions. Several groups around the world are racing to launch quantum experiments aboard satellites or even the International Space Station. But Singapore's Centre for Quantum Technologies has worked hard to shrink the usual quantum lab equipment down to the size of a sandwich — the space available for science experiments aboard a cheaper "CubeSat" that can piggyback on rocket launches for bigger missions. "For this approach to work, we must develop robust quantum entanglement technology capable of working in a space environment," said Daniel Oi, a physics lecturer at the University of Strathclyde in the U.K. "The source has to survive the forces and vibration of launch, vacuum and rapid thermal swings as the satellite moves between day and night [approximately] every 90 minutes, and the radiation environment in low-Earth orbit." The Singaporean balloon test carried the quantum experiment to a height of 23 miles (37.5 kilometers) from a site in Germany on May 18. That showed the equipment could do well in near-space conditions well below the 62-mile (100-kilometer) altitude considered the edge of space, but still three times higher than a commercial airliner's cruising altitude. Students gather to watch researchers prepare the Small Photon-Entangling Quantum System for a test launch aboard a weather balloon at a field near Heinrich-Suso-Gymnasium Konstanz in Germany. Squeezing a quantum experiment into a tiny CubeSat would also enable faster, cheaper deployment of a quantum communications network. Researchers had to not only shrink the quantum experiment to the size of a sandwich, but also figure out how to make it run on just 1.5 watts of power (less than the power used by a charging smartphone). "Now, in a typical CubeSat, 300 milliliters may be available for a science experiment," Ling told InnovationNewsDaily. "This is less volume than in a can of soda!" Researchers track the location of their balloon-launched quantum experiment after it came back down to Earth. Such an experiment would harness quantum entanglement — the mysterious phenomenon that allows a pair of "entangled" particles to behave as one even if separated by huge distances. Quantum communication uses entangled light particles (photons) as shareable keys for decoding messages. The principles of quantum physics also make it impossible to intercept an entangled photo without corrupting its entangled partner and tipping off the senders and receivers. Security companies already offer quantum communication across fiber optic networks, but that method works only for distances up to about 62 miles (100 kilometers). European and Chinese researchers have also begun testing how to beam entangled photons between ground stations, but many have their eye on the biggest prize — beaming entangled photons between ground stations and relay satellites to create a secure global network. The latest Singaporean balloon flight only tested the Small Photon-Entangling Quantum System (SPEQS) in "off" mode, but future balloon launches could test quantum entanglement up in the air before going for actual quantum entanglement in orbit. A separate satellite-engineering group in Singapore is working to build the CubeSat that could help make scientific history.